Buy this router on Amazon, or any computer store close to you. 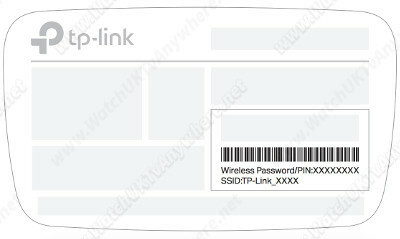 This guide explains how to connect your brand new TP-Link WR841N router to WatchUKTvAnywhere VPN. This section explains how to configure a brand new TP-Link Wireless N Router WR841N for basic internet access. With the Router powered on, press and hold the WPS/RESET button (for about 10 seconds) until all LEDs turn off and then on. Then release the button and wait the Router to reboot to its factory default settings. Router is ready when orange LED turns green (in about 10-15 seconds). Where is the WPS/Reset button? - Look at the back of the router where antenas attach to the case - There is two little round black buttons - one of them is labeled "WPS/Reset". 2. How to connect VPN router. - Use provided ethernet cable to connect your new TP-Link router WAN port (blue) to ANY LAN port of your main internet router. - Power up TP-Link router. Note that LAN ports on your main router may not be colour coded and may be labeled Ethernet instead. Modern routers come pre-configured with WiFi name and password. Look at the stiker label on the bottom of your router and locate the SSID and Password. This it the web configuration panel of your router. Otherwise simply continue with next step. Confirm that you are able to browse the Internet from a computer connected to VPN Router - try your favoirte website. Optionaly - change your WiFi name (SSID) and Password to something easy to remember. Refer to router's Quick Installation Guide booklet. Default username and password are admin / admin. 1. Go to Network --> WAN.